I hardly know how to apologize for my long silence. I can hardly remember the last time I wrote… maybe when the hauslains were fighting? That has long since been settled, by the way, in case I neglected to tell you, and Matyu and Keti seem to be as friendly as ever (and spiritually seeking– continue to pray for their salvation)! Our computer died, and then we’ve been limping along using another one whose cord had to be jimmy-rigged by my amazing husband, though it could not be used while charging and only had a battery life of about half an hour which we tried to spread out over a couple of days each time to avoid running the generator every day… so though we could check email and write really fast replies to a very few, I’m afraid hardly anyone has heard from us for a long time. Sori tru! But now the Lord has provided a lovely new computer for us, and it will be good to catch up on all that correspondence and hear from some of you again. The most exciting news, in case some of you haven’t heard, is that we’re expecting a baby!!! I’m just now finishing up my second trimester, and our little “Wiggly” is due in May! We’re thankful that it has gone very smoothly so far. This has bumped up our furlough plans… we leave Kiari in less than 6 weeks and fly out of Goroka on March 8, arriving in the States on the 12th, Lord willing. Please pray for us as we wrap things up, pack our house, etc. We feel so excited to see our families and leave behind the many ministry pressures here, but at the same time we are sad to leave our home and friends in Kiari. We are praying that the Lord would quickly provide our lacking support (still catching up from getting married, and now adding another family member!) so that we can return in a year or less. In other news… late September/early October we enjoyed helping host a team of 3 men who came to build a house for our coworker Karen Hall. In only 9 days they had the entire structure up, though the inside is still being finished bit by bit. 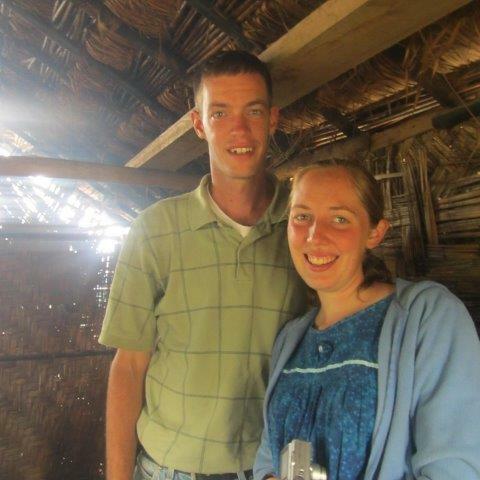 Later in October we got to spend a few days with the Ritschard family, fellow GFA missionaries in another part of PNG. That was a huge encouragement. November we were here in Kiari all month, just busy with day-to-day projects, dealing with the plethora of issues that come up every day, and much studying for teaching/preaching. December was a supply trip and then all of the Christmas activities with the church here… three “bungs” (all-day gatherings) in a week was fun but tiring. Then came a very special treat for me… my very first visitor in my 2 1/2 years in PNG! Beth was with us in Kiari for a little over a week and helped me with the huge (and sad) task of packing up the school. She was quite the trooper, as the rats had enjoyed quite a holiday in some places! We were able to get everything boxed up though, and hopefully if the Lord provides for the school to open again, whoever unpacks everything will have a much less revolting task. We went to town and spent the weekend with her there before her flight out Monday. True to form, the plane was 4 hours late leaving and she missed her other flights back to Australia, but thankfully made it home the next day. After Beth left we were able to travel to another place in PNG where we were able to see the dentist before heading back to Kiari. Jeff caught the flu and had a fever for 4 days but seems to be feeling better today. Please pray for the Lord to strengthen him as he preaches twice tomorrow. The challenges of the ministry continue, and though we are very burdened for the Lord to work in the hearts of the men who are causing trouble and for the Lord to grant discernment to the other believers, we have come to see that the main issue is us– will we trust the Lord and endure? Thanks for your continued prayers. I’d especially appreciate your prayers for a lady who came to sit with me during prayer time the evening before we left for town. She said, “You go ahead and pray, but I can’t pray because I’m not saved.” What an open door and great opportunity to share with her about my devotions in 1 Corinthians– the marvel of how unbelievers can’t understand spiritual things, but when the Lord gives His Holy Spirit we are able to discern and understand. She seems to be hungry and seeking; please join me in praying that the Lord will grant her His miraculous light– the very mind of Christ– so that she will come to comprehend the things of God as she sits under the preaching of His Word. As I read over what I’ve written I’m sorry it’s so scattered– I think I’m out of practice writing for one thing, plus definitely more scatterbrained than usual since I’ve been expecting! Hopefully it’s basically intelligible anyway, and I didn’t leave out anything too important. Thanks for your patience and prayers.